Carry On, Sergeant. Peter Rogers Productions 1958. 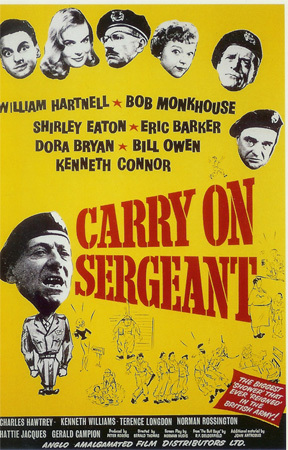 In the last few months, I’ve become aware of the British cultural phenomenon of the Carry On franchise. While this may not be the most typical of the series, it’s the first, and so would have the most to do with the “Carry on” name. Also, it’s an opportunity to see William Hartnell in the sort of role he was known for before Doctor Who redefined his legacy and allowed him to escape his former typecasting.